So what's the deal with these Surfmat things? 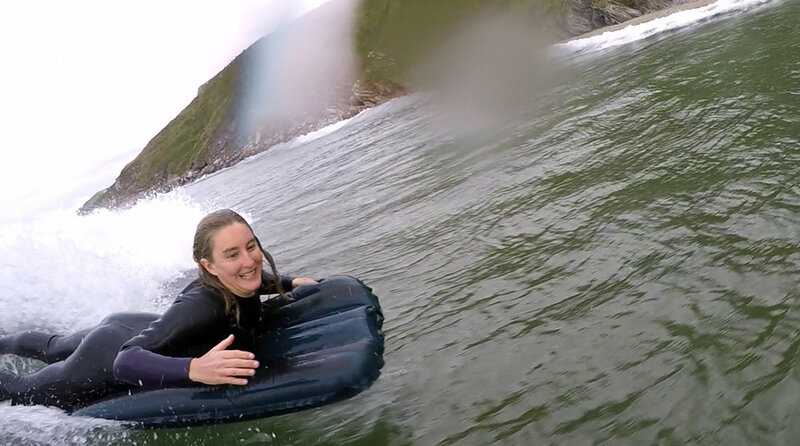 They're just like inflatable bodyboards, right? Surely you just jump on them and go! Well... It might not be quite as easy as it looks. The number of experienced surfers who have floundered around on a squishy bag of air for a session or two before tossing it aside, cursing, is testament to the fact that Surfmats, in all their simple beauty, can be more than a little tricky to master. Mats are ridden without using a leash which can be a real culture shift for many modern surfers, and you will quickly learn to apply a bear hug in the blink of an eye to avoid the long swim. You will also learn to love the freedom of being out in the water with just you, your fins and a bag of air. Hopefully you’ll find this information useful. To back it up, we’ve included a video featuring the master himself, George Greenough, talking on the subject of mat surfing, courtesy of Paul Gross. The primary key to surfmat performance is correct inflation for the conditions. Softer inflation levels allow the mat to spread out and undulate over the water like the cushion of air underneath a hovercraft. This results in a faster, looser ride with more glide allowing the mat to bomb over flat sections like nothing else in the water. This sensation of frictionless skimming becomes more apparent as air volume is decreased, however, holding a line gets trickier, so there is a balance to be found between glide and tracking. Higher inflation gives more control and hold at the expense of speed but is the key to keeping your line in bigger and/or hollower surf. Measuring air volume is done by bending the mat until the fabric goes taught. 45-90 degree bend is a good average volume of air to start with. The more skilled riders will often be seen riding mats which virtually flop over in a 180 degree fold! It’s this level of inflation (or perhaps deflation) which led George Greenough to coin the phrase “the magic towel”. Don’t get hung up on these angles though as different weight materials and mat design will need different levels of inflation for the same result. There are no rules on inflation other than getting the best performance out of your mat. You will probably find that as you start out, you need your mat relatively hard but will start to ride with less and less air as you get more in tune with the art of mat surfing. Paddling out can be a bit of a challenge on a surfmat, but practice makes perfect as they say so just keep going! Your legs do a lot of work on a mat, particularly when catching waves so paddling out can be a good time to give them a bit of rest. Getting way forward and arm paddling will result in surprisingly quick progression. Given the pliable nature of surfmats, you can kick in the 4x4 (arms and legs together) more easily than on solid craft such as paipos and bodyboards so you can really charge at those sneaker sets! Lying with your chin level with the nose, paddle hard 4x4 at the approaching wave or white water. When it’s time to get underwater, grab good handfuls of the front corners and squeeze the rails together which will stiffen up the mat. Push the surfmat down hard by straightening both arms. Dive headfirst after the mat sticking your legs up in the air to get as deep as possible. Simultaneously push the surf mat forward and arch your back, allowing the mat to bring you back to the surface and pull yourself forwards into the original paddling position as you surface. Start paddling quick because there’s probably another one on the way! For a laugh, try this technique without a wave and you’ll see you just do a strange forward-roll type affair. When actually duck-diving, the wave hits your legs to counter the mat’s efforts to pull you into a somersault. On really big days, some matters swim out to the line-up with a deflated mat stuffed down their wetsuits. This can certainly make duck-diving easier but tends to leave pockets for cold water to swill about inside your suit. If you want to try that in UK waters in the middle of February then be my guest!!! Whatever works for you is right at the end of the day. With a little practice you’ll find that you can get into waves incredibly early on a surfmat. One of the key points when catching waves is to remember that the mat is a pliable, floppy object so you do not have the luxury of pushing down on it. Any changes you make in your body shape are directly transmitted through the mat. Also, arm paddling in the way you would to paddle out is pretty hard work and often unsuccessful as the nose of the surf mat tends to fold up causing a bow wave, unless you have it pumped right up. Some people do, somehow, manage to successfully arm paddle but it’s a rarity! Paddle into position. Consider angling your take off in faster breaking, hollower waves. Hang off the back of the mat holding the front corners (or the rails 4-5” back from the nose on steeper waves). Keep your arms straight and your body as flat in the water as possible. Keeping your head down will prevent you from arching your back. Kick as hard as you can using the full length of your legs. Trying to minimise splashing to get the maximum drive out of your fins. As you get picked up by the wave, rapidly pull yourself up the mat, keeping your elbows in and your chest down so that your shoulders are close to your hands. A dolphin kick can really help with this. This rapid, simultaneous forward boost, along with the spreading of weight will kick the mat into life and make it fly! In fast breaking waves, try getting a high line to start with rather than the traditional drop-and-turn technique used with boards. It can be the difference between a frustrating session of straight-handers and a festival of freight-train speed demonry! Body positioning is the crucial when getting to grips with mats. If you’ve ridden bodyboards or paipos then you need to be prepared to forget everything! Due to the pliability of surfmats, your body positioning and weight distribution determine factors such as rocker and pivot points. You really are completely connected to the ocean when matting. If you’ve arrived at this point having followed our tips on catching waves you’ll be forward on the mat with your chin near the valve. Your elbows and hips play a crucial role in providing structure to the inside rail. Unlike on a bodyboard, you don’t prop yourself up on your elbows as this serves to stall the mat. Instead, you should have your inside shoulder over your hand, elbow tucked in with your hand on the deck near the front. Lifting your head is fine but arching your back too much will result in pushing down on your elbows. Basically, position your body to keep the mat as flat as possible to reduce resistance and maximise speed. Your outside hand is placed on the rail in most circumstances, however, it is positioned towards your shoulder rather than your hip as in bodyboarding. As you roll onto your inside rail, the outside rail can be used to carefully fine-tune trim. This video clip of mat maestro Andrew Stephen Buck illustrates this perfectly. Swimfins take on a new role once you’re up and riding. They still retain the ability to give you that little shove along should the need arise but by far the most important job they do is related to hold and forward projection. Ideally, lifting both of your fins clear of the water is preferred due to eliminating drag so, similar to inflation, getting the balance between glide and hold is constant trade off. More often than not, dipping one or both fins is necessary to establish and hold solid turns and trim. Types of fin have been discussed in the which fins section so we won’t get into that here other than to say that a good protruding outside edge is essential. Driving the mat can be a tricky business to start with but a few key points can really help:Rolling onto your inside rail can help keep a line and turns are made from the hip rather than yanking up the outside rail. The outside rail can be lifted to increase hold and to helf find that sweet spot to move the mat up through the gears. The key is to keep it smooth. Linking a number of turns together will pick up increasing amounts of speed. Banked bottom-turns look great and generate a lot of speed. Roll onto your inside hip and use your outer hand to squeeze and lift the rail to increase the mat's inflation level and bank through the turn. Your Inner elbow is tucked in, almost but not quite touching the water. Dip your inside fin. Un-banked bottom-turns increase the mat’s trim speed with a “yaw” turn off the bottom. Rather than banking the mat off the bottom, the rider eases the nose back up the face just a few degrees, allowing the mat to take a natural track back up the face and into the power. This technique displaces a minimal amount of water meaning the maximum amount energy goes into projecting the mat. Cutbacks vary depending on the type and power of the wave or the mood of the mat surfer.Hard carving cutbacks require a fairly powerful, punchy wave but can quickly get you back in the pocket nice and high to really kick through the gears and get moving at speed. Similar to banked bottom-turns, roll on to your outside (shore-ward) rail, compress and lift the inside rail and dip the outside fin. Sometimes you might find it helpful to press down with your outside hand whilst lifting the inside rail as you squeeze. This will help prevent the mat bogging and see you through the turn. Drifting through the turn, similar to an un-banked bottom-turn can maintain speed and allow the rider to get back into the pocket from way out on the shoulder. This can be a very effective way to get the most power out of small or gutless surf. Tube riding requires you to hold a high line initially so compressing the outside rail perhaps combined with a gentle lift can help. Keep your head low and move it over the inside rail, rolling your weight towards the wave to create an even, clean rail. As a general rule, the mat goes where your eyes look so pick a point well down the line and charge for it. As you begin to reach the exit, you may want to let off the compression to let the mat kick up a gear and fly out of the barrel. Lip bashes and floaters are possible on the mat, as are airs on occasion. Get as much speed as you can and pick a point to hit the lip. Try to have a plan on the kind of manoeuvre before hand, based on where you want to end up. Start your turn just before hitting the lip, squeeze the rails both to hang on to the mat but also to stiffen it up so that the lip has a semi-solid object to push back around. Spot your landing early and shape your body to make the landing as you come down. Remember, the mat has no structure other than the one you give it so try to go with the flow to minimise resistance and come out of the move smoothly. It can be helpful to push the mat out in front of you with straight arms on free-fall landings to help avoid pearling. You can then hop forwards once down.